Superheroes. Who among us hasn’t at one time in their life donned a blanket cape or rushed around the park pretending to have flight or super-strength. The draw is undeniable; if you are a superhero, you can still be yourself, but stronger, faster, better. Since we can’t actually get superpowers (yet? ), what better way to experience the excitement than playing a boardgame about being superheroes? While a number of superhero games had been released in the past, most were quick knockoffs or movie cash-ins with no real quality inside the box. 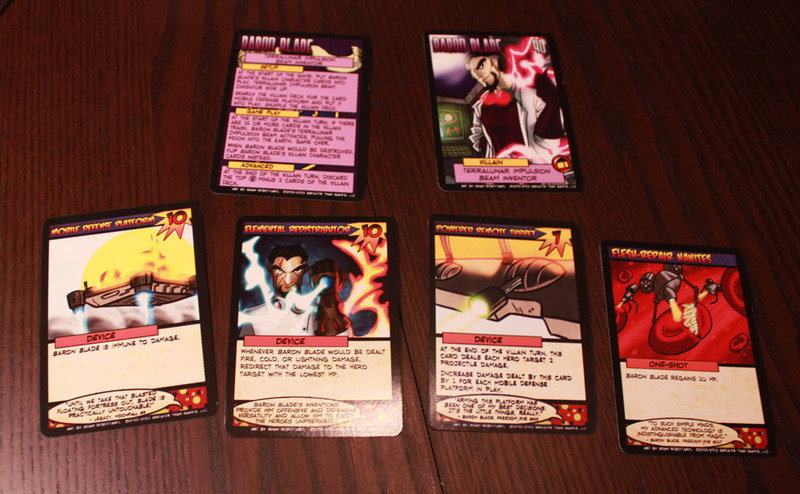 Then, one day, along came Sentinels of the Multiverse – a superhero game not tied to a movie, show, or comic book, targeting the hobby-gaming market with the promise of substantial gameplay. We reviewed the original game, which came in a tiny box and consisted entirely of an unruly mess of cards. We liked it, but felt that it fell short in many areas. Fortunately, the game was successful enough to warrant an expansion (and then two more), and with that first expansion came the new “Enhanced Edition” of the base game. With some gameplay tweaks, a much larger box with better storage, and the addition of tokens, lets talk about how the Enhanced Edition improves upon the original game. You may have read our original review or even played the first edition of the game, but if not, here’s a complete overview. 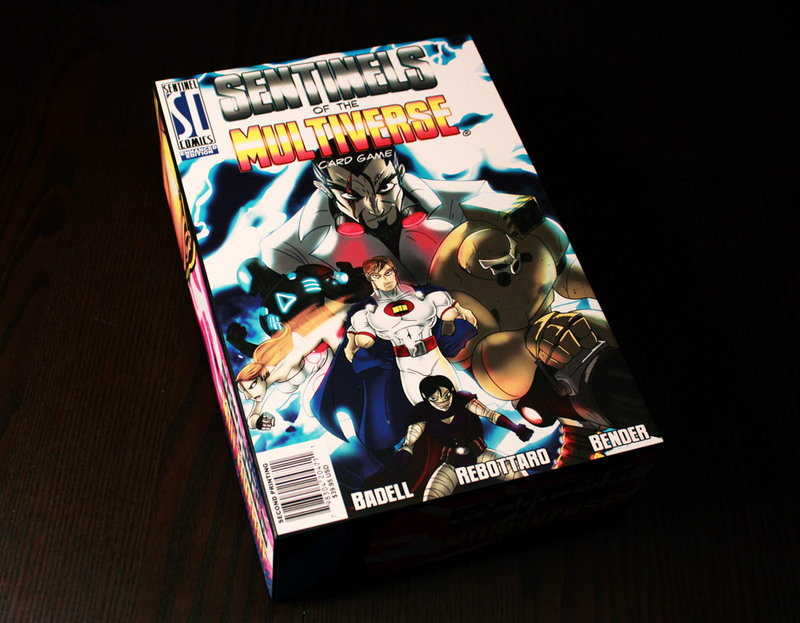 Sentinels of the Multiverse is a fully cooperative game in which 3 to 5 players take on the role of superheroes attempting to defeat one very powerful arch-villain per game. Each round consists of a Villain turn, player turns, and an Environment turn. 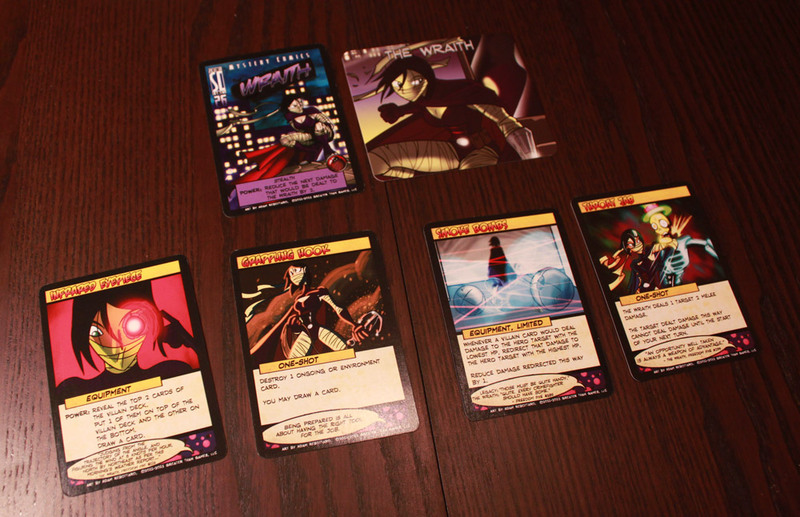 First, the Villian attacks the players in various villainous ways and/or defends him- or her- self by revealing a card or two from the Villain deck, as directed by the Villain character card. Villains like the Baron Blade and his deadly weaponry. 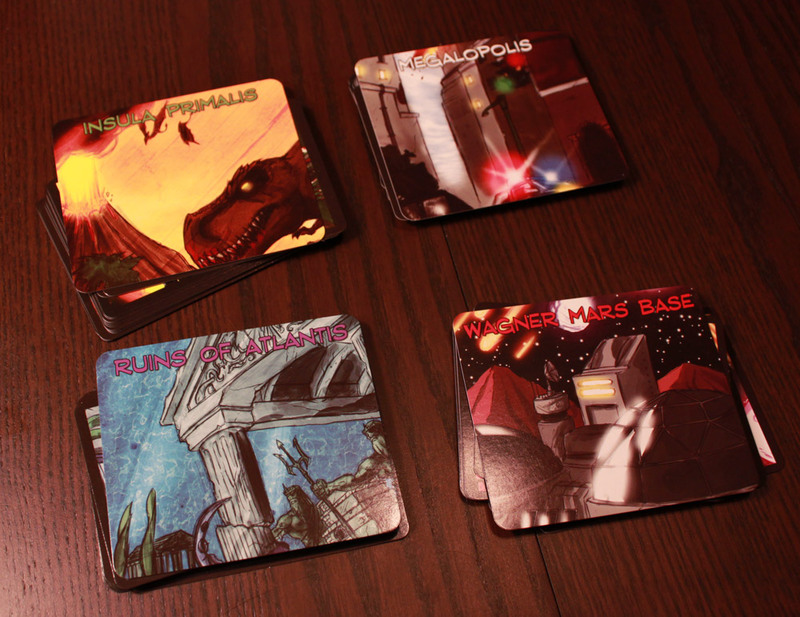 Then each player gets a turn to play a card, use a “power,” and then draw a card. Cards grant one-time-use abilities or add more “power” options for the player to use. Powers range from dealing damage, to healing other players, to manipulating decks, to boosting powers of one or more players. As the game goes on, the player’s tableau of powers and effects generally increases, granting increased power and a variety of options. After the players finish, the Environment reveals a new effect, which varies from helpful to hurtful for either side (and sometimes both). When a player dies, or is “knocked out,” instead of being eliminated they get a choice of one of three possible actions to perform on their turn to help another player. Thus, if the battle is particularly heated and multiple players are killed, the remaining player[s]become much stronger as, thematically, they fight to avenge their fallen brethren. Each player represents a single superhero with a specific deck of cards that provides unique powers and abilities. The base game also includes 4 Supervillains and 4 different environments, which makes every game at least slightly different. 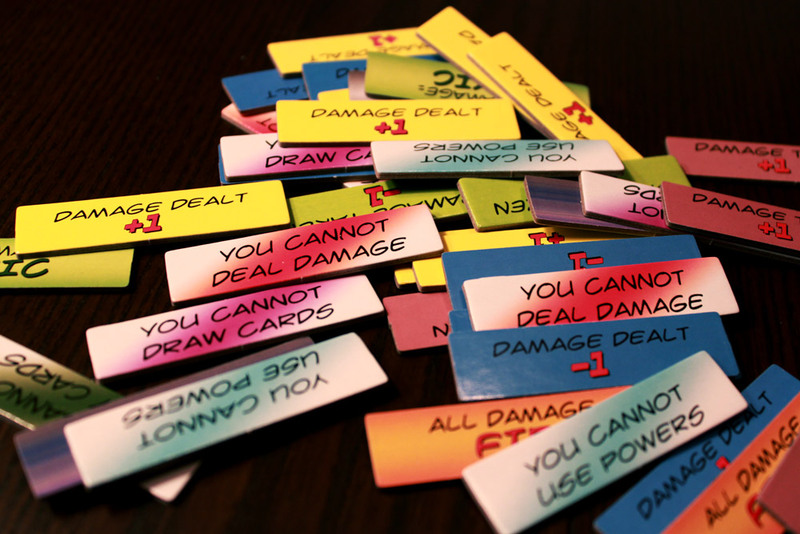 The game ends when either all players are knocked out, or the villain is defeated according to his or her villain card. In one of four exotic locales! 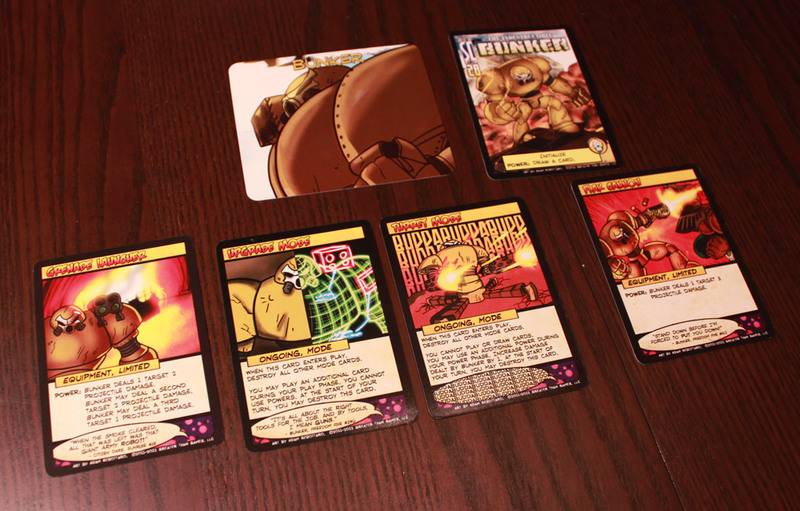 Sentinels of the Multiverse does a lot of things very well, and the Enhanced Edition vastly improves on many of the flaws from the original, leading to a much better overall experience. However, it still suffers from a few shortcomings. But do these shortcomings ruin the game? Sentinels was always, and still remains, a highly thematic yet very easy to play card game, with each session unravelling a new story between the heroes and villains that you and your friends will relive in memory time and again. The heroes are varied and unique, with powers and abilities that actually make each one feel different to play. Different tactics are required, and the different heroes interact in surprising ways. For example, Tempest can create powerful storms and chain damage from minion to minion, while Tachyon is faster than a speeding bullet and as her discard pile increases in size, her speed and deadliness only increases. Wraith has gadgets to be prepared for any situation. Fanatic is devoted religiously to her cause and will sacrifice herself to deal incredible amounts of damage to her enemies. I could go on; all the heroes have their stories, their powers, and their mechanisms. The characters range from damage-dealing brute force machines to tactical support players, and every character can do some pretty cool things. The nice thing about the game is that with the 1 card/1 power system, the game builds in complexity over time. It doesn’t take long to get into the game; only a short rules explanation is required. Players can learn new details as their cards come into play, and turns are so quick players have a chance to grasp the details before trouble really starts. Batm- I mean Wraith uses gadgets and superior punching skills to tame crooks. One of the main things I disliked about the original edition was the tedious nature of stats tracking. During the course of the game any given player (or villain) can have damage boosted, become immune to certain types of damage, change the types of damage that they’re dealing, and a great number of other minor modifications. This, in addition to the unique set of hit points for each hero, villain, and mini-villian had to be tracked, but nothing was included in the box to do so, which meant someone keeping track of everything on a piece of paper. This method was tedious and slowed down the game, preventing the scorekeeper (usually myself) from really getting immersed in the story or experience because he or she is too busy reminding everyone else what boosts and penalties they have, and marking down HP with every attack. The new enhanced edition includes a huge number of tokens – numbered tokens for tracking HP and any other numeric value, and a whole slew of other tokens that serve as reminders for boosted damage or immunity or most of the other persistent effects. This improvement DRASTICALLY increases the fun of the game. As I said, I was usually the one doing scorekeeping and it kept me out of the flow of the game. Now, we can just pile up tokens for hit points by each character and as you take damage you just discard the appropriate number of tokens. It allows each person to track their stats quickly, and it also gives everyone a clear visual indicator of how much damage any particular character can take. Especially when a large number of low-level minions are in play, this method of stats tracking so dramatically decreases the clunkiness inherent in bookkeeping and allows much deeper immersion and participation for all players. In my previous review I decried the poor “story arc” of the game, in that defeat often came suddenly and victory was often a semi-tedious affair of wearing the villain down point by point, long after he or she reached the peak of her power and causing the game to end after the excitement had faded. Due in large part to the easier method of stats tracking, I no longer find this to be an issue. You’re still nickel-and-diming the villain to death, but increased immersion makes the game arc flow much better. Since you’re not stopping to mark off a point here and there, you stay engaged. Another improvement helps this arc as well. 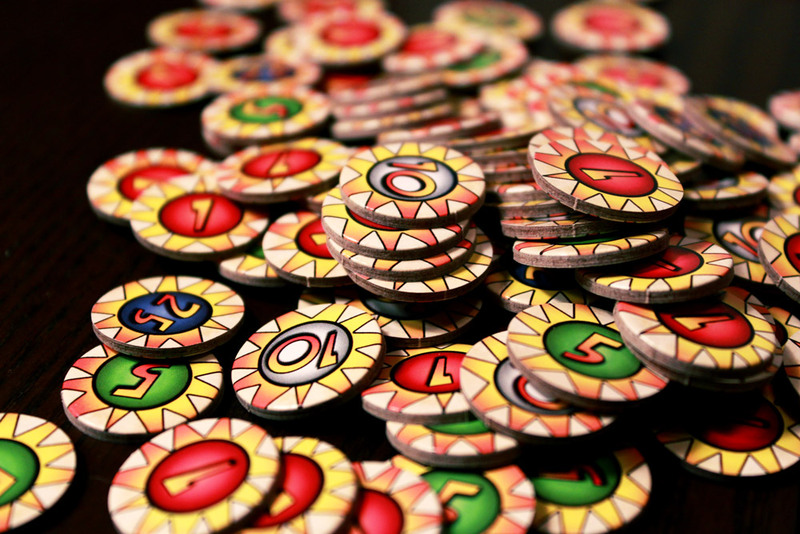 The original edition was scaled for 4 players, and was generally much easier with 5 players and more difficult with 3. Now, many of the enemies’ attacks and powers adjust based on the number of players. While there are still a few leftover elements that don’t scale, for the most part the new scaling mechanism makes for a more balanced fight whether you have 3 or 5 players. In fact, looking back at my original review, every single con I had was fixed by this new edition, which is awesome. That being said, now that those cons are fixed, another issue rather stands out. It’s what I’ll refer to as “power wipe.” A few of the villain cards (and some environment cards) attack the players by forcing them to discard certain cards from play. Often this is ALL of one type of card, such as all Equipment cards or all Ongoing cards. It’s a tricky thing here, because in movies and comics, heroes losing their powers is a fairly common staple of the genre. But due to the nature of the game, the “power wipe” event is just not very fun. Given the limited number of actions you can take on your turn, it takes a while to get a good set of powers out on the table, and a big part of the fun of the game is building up these powers until you can do crazy awesome things on your turn. But characters tend to rely on one type of card, which means if that type of card is wiped, they’ll be completely powerless. I’ve had games where I was doing great, and suddenly a power wipe comes a long and I spend the rest of the game drawing cards because I can’t get anything useful back on the table. It’s just not very fun. The wipe tends to affect some characters more than others; while some heroes don’t need big sets of powers on the table, some like Wraith depend on their equipment cards being in play and can do very little when those cards are wiped. Especially if it happens at the wrong time. Precious life points. They were not stingy with the tokens here. Other luck-based elements occasionally crop up that can damage the experience. For example, you might draw cards and powers that are stellar at taking on a large number of weak minions when it’s time to hit the big baddie hard; likewise, you may find you have a power to deal a ton of damage on one thing only to find the big baddie protected by his army of minions, leaving you either unable to act or waisting a super attack on a weakling. You might have held onto a card for just the right moment and then played it for your next turn to be awesome, only to have your abilities taken from you. This random stuff doesn’t pop up very often. The power wipe, even when it happens, often still leaves most players with things to do. If you have powers in play you can almost always do SOMETHING useful and fun, even if it’s not the optimum moment- and often you can save your optimum power for just the right moment to make the most difference. Also, becoming familiar with your hero decks (and the villain decks as well) can certainly help you prepare for those wipes and hold back the right cards in your hand so you still have something you can use after one happens. But it does happen, and though it’s not a game ruiner, it is a downer. I just don’t like the cooperative game tactic of removing player abilities to increase the challenge; it’s one thing to lose because the enemy was just too strong and lucky that time, or because you made a few mistakes, or you were just too inexperienced. You still get entertainment out of losing. But, losing because your ability to react to the threats at hand was removed, that is less fun. Bunker relies on his equipment and bulking up with upgrades. A poorly timed equipment wipe can set him way back. 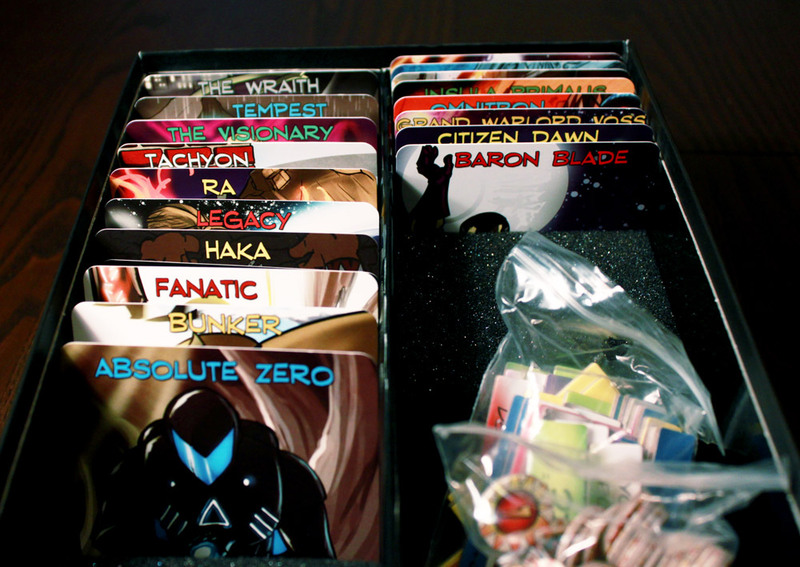 One last item worth mentioning; while the original Sentinels box was tiny and had nothing in the way of organization (you’d basically end up with messy pile of cards to sort out each time you opened it), the new box is much bigger, and it has an insert with dividers so you can keep all of your cards nicely organized. It’s an excellent improvement that makes the game that much easier to play – no longer do you need to sort out cards or figure out which deck belongs to which hero. Now I just open the box, face it towards the other players, and tell them to pick a hero. I love the new box. The card stock has been improved over the original, but I wouldn’t call it stellar. It’s fine. The art on the cards has sort of a low-budget “indie” feel to it which I find enjoyable, and the scenes depicted on the cards are certainly enjoyable to look at. Ah, who am I kidding. I love the art. It’s got a very fun vibe to it. If you haven’t played Sentinels of the Multiverse and you like superheroes, or if you’ve just played the original edition, you need to play this game now. It is by far the best superhero game out there, and the box is packed to the brim with awesome. It’s not a perfect game and you will experience a few lackluster moments here and there, but with such a large number of heroes to try out and the interesting mix of villains and environments to deal with, you’ll get a lot of mileage out of this beast before even adding expansion packs. If you own the original, it is definitely worth considering getting the new edition. At least do yourself a favor and order the “extra tokens” pack, but the new box and storage system coupled with the tokens, updated cards (and improved card stock), and adjusted mechanisms are well worth the price. While there’s room for improvement, I am looking forward to trying out the many new environments, heroes, and villains in the 3 expansion packs. iSlaytheDragon would like to thank Greater Than Games for providing a review copy of Sentinels of the Multiverse: Enhanced Edition. I’ve had a chance to play this a couple times after work with co-workers the past few weeks and really liked it. Finally picked up my own copy last weekend. Glad I waited for the Enhanced Edition! I got a chance to try this at GenCon last year. I thought this was an awesome concept that was well executed. I had a ton of fun playing it, but my one complaint was that we didn’t have any tokens or anything for tracking stuff. I can certainly imagine those being of immense help to both game play and immersion.